Sun., Apr. 14, 2019 -Rocky Mount School and Ross School Info & Photos added under "Cultural Resources > Schools"
Sun., Apr. 7, 2019 -Rabbithead School and Reed School Info & Photos added under "Cultural Resources > Schools"
Tues., Mar. 26, 2019 - MCHS Spring Newsletter added under "About Us > Newsletters"
Sun., Mar. 24, 2019 -Pleasant Hill School and Post Oak School Info & Photos added under "Cultural Resources > Schools"
Sun., Mar. 17, 2019 -Pleasant Ball School and Pleasant Grove School Info & Photos added under "Cultural Resources > Schools"
Sat., Mar. 2, 2019 -Our Lady of the Snows School and Pisgah School Info & Photos added under "Cultural Resources > Schools"
Sun., Feb. 24, 2019 -Old St. Elizabeth School and Olean School Info & Photos added under "Cultural Resources > Schools"
Sun., Feb. 10, 2019 -Mount Pleasant School and Number Four School Info & Photos added under "Cultural Resources > Schools"
Mon., Jan. 28, 2019 -Miller School and Mount Herman School Info & Photos added under "Cultural Resources > Schools"
Sat., Jan. 19, 2019 -Manning School and Mary's Home School Info & Photos added under "Cultural Resources > Schools"
Sun., Dec. 30, 2018 -Mace School and Madden School Info & Photos added under "Cultural Resources > Schools"
Thurs., Dec. 27, 2018 - MCHS Winter Newsletter added under "About Us > Newsletters"
Sat., Dec. 8, 2018 -Lawson School and Lurton School Info & Photos added under "Cultural Resources > Schools"
Sun., Nov. 25, 2018 -Keyes School and Laurel Ridge School Info & Photos added under "Cultural Resources > Schools"
Mon., Nov. 5, 2018 -Johnston School and Kempker School Info & Photos added under "Cultural Resources > Schools"
Fri., Oct. 19, 2018 -Jenkins School and Jim Henry School Info & Photos added under "Cultural Resources > Schools"
Sun., Oct. 7, 2018 -Independence School and Jeffries School Info & Photos added under "Cultural Resources > Schools"
Sun., Sept. 30, 2018 -Howell School and Iberia School Info & Photos added under "Cultural Resources > Schools"
Sat., Sept. 22, 2018 -Holder School and Honey Springs School Info & Photos added under "Cultural Resources > Schools"
Tues., Sept. 11, 2018 - MCHS Fall Newsletter added under "About Us > Newsletters"
Tues., Sept. 11, 2018 -Hicks School and Hoecker School Info & Photos added under "Cultural Resources > Schools"
Sat., Sept. 8, 2018 -Harmony School and Hickory Point School Info & Photos added under "Cultural Resources > Schools"
Fri., Aug. 31, 2018 -Gott School and Harbison School Info & Photos added under "Cultural Resources > Schools"
Sun., Jul. 8, 2018 - MCHS Summer Newsletter added under "About Us > Newsletters"
Sun., Apr. 29, 2018 -George School and Ginger Ridge School Info & Photos added under "Cultural Resources > Schools"
Wed., Apr. 11, 2018 - MCHS Spring Newsletter added under "About Us > Newsletters"
Tues., Mar. 6, 2018 -Gageville School Info & Photos added under "Cultural Resources > Schools"
Sat., Jan. 27, 2018 -Franklin School Info & Photo added under "Cultural Resources > Schools"
Mon., Jan. 1, 2018 -Fletcher School Info added under "Cultural Resources > Schools"
Sat., Dec. 16, 2017 - MCHS Winter Newsletter added under "About Us > Newsletters"
Sun., Dec. 3, 2017 -Elm Spring School Info & Photos added under "Cultural Resources > Schools"
Fri., Nov. 10, 2017 -Elliott School Info & Photos added under "Cultural Resources > Schools"
Mon., Nov. 6, 2017 -Genealogy Links updated under "Links > Genealogy"
Fri., Oct. 27, 2017 -Dog Creek School Info & Photos added under "Cultural Resources > Schools"
Fri., Oct. 20, 2017 -Curry School Info added under "Cultural Resources > Schools"
Thurs., Oct. 12, 2017 -Cross School Info & Photos added under "Cultural Resources > Schools"
Sat., Oct. 1, 2017 -Cooper School Info added under "Cultural Resources > Schools"
Sat., Sept. 23, 2017 - MCHS Fall Newsletter added under "About Us > Newsletters"
Sat., Sept. 23, 2017 -Colburn School Info added under "Cultural Resources > Schools"
Thurs., Sept. 14, 2017 -Clark School Info & Photos added under "Cultural Resources > Schools"
Sat., Sept. 9, 2017 -China School Info & Photo added under "Cultural Resources > Schools"
Thurs., Aug. 31, 2017 -Central Point School Info & Photo added under "Cultural Resources > Schools"
Sat., Aug. 26, 2017 -Capps School Info added under "Cultural Resources > Schools"
Sat., Aug. 19, 2017 -Buck Knob School Info added under "Cultural Resources > Schools"
Thurs., Aug. 17, 2017 -Brumley School Info & Class Photos added under "Cultural Resources > Schools"
Tues., Aug. 15, 2017 -Buchanan School Info & Photo added under "Cultural Resources > Schools"
Sun., Jul. 30, 2017 -Brays School Info & Photos added under "Cultural Resources > Schools"
Tues., Jul. 25, 2017 -Bond School Info & Photos added under "Cultural Resources > Schools"
Mon., Jul. 10, 2017 -Baumhoer School Photo added under "Cultural Resources > Schools"
Tues., Jul. 4, 2017 -Barton School Info & Photos added under "Cultural Resources > Schools"
Wed., Jun. 21, 2017 - MCHS Summer Newsletter added under "About Us > Newsletters"
Wed., Jun. 21, 2017 -Barnett School Info & Photo added under "Cultural Resources > Schools"
Wed., Jun. 14, 2017 -Bagnell School Photos added under "Cultural Resources > Schools"
Sun., Jun. 10, 2017 -Atwell School Photos added under "Cultural Resources > Schools"
Sat., May 27, 2017 -Allen School Class photo added under "Cultural Resources > Schools"
Tues., Mar. 28, 2017 - MCHS Spring Newsletter added under "About Us > Newsletters"
Wed., Dec. 14, 2016 - MCHS Winter Newsletter added under "About Us > Newsletters"
Thurs., Sept. 29, 2016 - MCHS Fall Newsletter added under "About Us > Newsletters"
Mon., Jun. 20, 2016 - MCHS Summer Newsletter added under "About Us > Newsletters"
Thurs., Mar. 24, 2016 - MCHS Spring Newsletter added under "About Us > Newsletters"
Thurs., Mar. 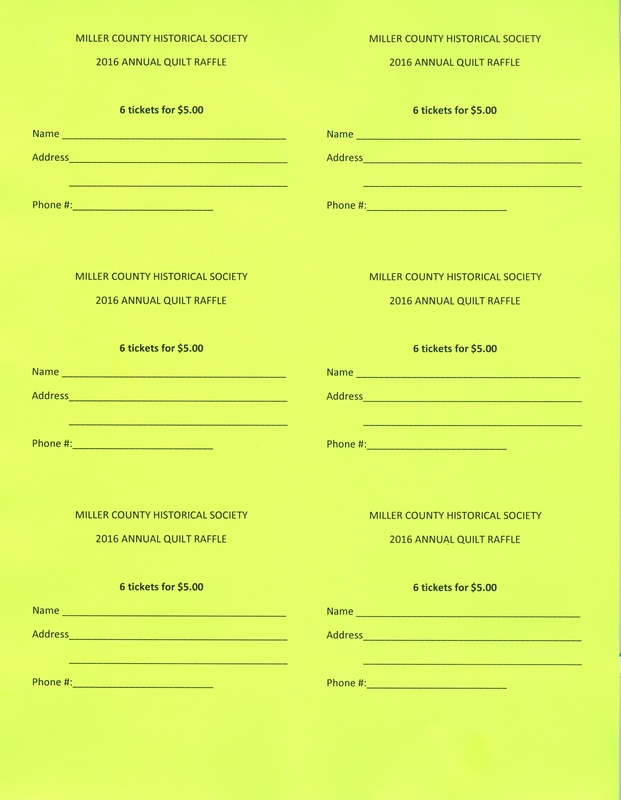 24, 2016 - 2016 Annual Quilt Raffle Tickets added under "About Us > Newsletters"
Mon., Dec. 7, 2015 - MCHS Winter Newsletter added under "About Us > Newsletters"
Mon., Mar. 16, 2015 - MCHS Spring Newsletter added under "About Us > Newsletters"
Mon., Jul. 7, 2014 - MCHS Summer Newsletter added under "About Us > Newsletters"
Wed., Apr. 23, 2014 - Judge Jenkins' History of Miller County under "Library"
Mon., Mar. 24, 2014 - MCHS Spring Newsletter added under "About Us > Newsletters"
Thurs., Jan. 9, 2014 - Bax Family Articles under "People > B - Bios"
Fri., June 07, 2013 - Town of Hoecker under "Communities > Hoecker"
Thurs., Nov. 21, 2012 - Mordeca Lane under "Publications > Window to the Past"
Thurs., Nov. 21, 2012 - Pearley Shockley under "Publications > Window to the Past"
Thurs., Nov. 21, 2012 - Sarah Hume-Gardner under "Publications > Window to the Past"
Thurs., Nov. 21, 2012 - Macajah Stout under "Publications > Window to the Past"
Thurs., Nov. 21, 2012 - John Henry Wyrick under "Publications > Window to the Past"
Thurs., Nov. 21, 2012 - Anderson Keeth under "Publications > Window to the Past"
Thurs., June 07, 2012 - James Perry Devore under "Publications > Window to the Past"
Thurs., June 07, 2012 - Carrie Minnie Fendorf Wright under "Publications > Window to the Past"
Thurs., June 07, 2012 - Clara Mae Weitz under "Publications > Window to the Past"
Thurs., June 07, 2012 - Marks Lessem under "Publications > Window to the Past"
Thurs., May 03, 2012 - Daniel Cummings under "Publications > Window to the Past"
Thurs., May 03, 2012 - Elizabeth Wall Cochran under "Publications > Window to the Past"
Thurs., May 03, 2012 - John M. Gardner under "Publications > Window to the Past"
Thurs., May 03, 2012 - Elizabeth Benage under "Publications > Window to the Past"
Thurs., May 03, 2012 - John Kallenbach under "Publications > Window to the Past"
Thurs., May 03, 2012 - Elias Smith under "Publications > Window to the Past"
Thurs., May 03, 2012 - David Herman Condra under "Publications > Window to the Past"
Sat., Mar. 03, 2012 - Obituary Book #3 under "Library > Miller County Obituaries"
Sat., Mar. 03, 2012 - Obituary Book #4 under "Library > Miller County Obituaries"
Thur., Nov. 17, 2011 - John Calvin Crane under "Publications > Window to the Past"
Sun., June 12, 2011 - Jesse James Parents (purported) under "Publications > Window to the Past"
Sun., June 03, 2011 - Clarence L. Casey under "Publications > Window to the Past"
Sun., June 03, 2011 - Garrett Allman Berry under "Publications > Window to the Past"
Sun., May 15, 2011 - Harrison Family under "Publications > Window to the Past"
Sat., April 30, 2011 - John Wesley Smith under "Publications > Window to the Past"
Sat., April 30, 2011 - Sen. Thomas Scott under "Publications > Window to the Past"
Sat., April 30, 2011 - Napoleon Bonaparte Wood under "Publications > Window to the Past"
Sat., April 30, 2011 - Rev. Henry Loveall under "Publications > Window to the Past"
Mon., April 12, 2010 - Iberia Bank Robbery By Peggy Smith Hake under "Yesterdays" > "Events"
Sun., Dec. 20, 2009 - John Pickering Family under "Publications > Windows to the Past"
Wed., Sept. 02, 2009 - Six (6) new Civil War pages added under "Yesterdays > Civil War"
Wed., Sept. 02, 2009 - Private Fremont Watkins, A Casualty of WWI added to "Window to the Past" of the "Publications" section. Wed., Sept. 02, 2009 - Miles Carroll added to "Window to the Past" of the "Publications" section. Wed., Sept. 02, 2009 - Reynolds - Agee added to "Window to the Past" of the "Publications" section. Tues., September 01, 2009 - Patchquilt Soldier By Greg Huddleston, Brumley, MO under "Yesterdays" > "Civil War"
Wed., July 29, 2009 - Satterwaite Rowden letter added under "Publications" > "Window to the Past "
Wed., July 29, 2009 - Williamsburg - The Town That Never Was under "Communities" - "All Communities "
Wed., July 22, 2009 - Samuel Hickman bio. added under "Publications" > "Window to the Past "
Tues., June 16, 2009 - Rush family Barbers Photo added under "Yesterdays > Commerce & Industry "
Mon., June 15, 2009 - Rush-Loveall Photos added under "Yesterdays > People "
Sun., May 24, 2009 - Carl Hauenstein, Senior, December 19, 1936 under "Letters Home"
Wed., December 26, 2008 - Popplewell Farm History under "Cultural Resources" and "Homesteads"
Sun., August 24, 2008 - Frank S. Ramsey added to "Window to the Past" of the "Publications" section. Sun., July 20, 2008 - Women's Progressive Families Association & Iberia Community Club added to "Organizations" of the "Yesterdays" section. Mon., June 23, 2008 - Iberia Cemetery added to "Landmarks" of the "Cultural Resources" section. Mon., June 23, 2008 - Rush-Loveall Family added to "People" of the "Yesterdays" section. Thu., June 05, 2008 - Miller County Obituaries book #2 added to "Obituaries" of the "Library" section. The entire Obituaries section has been revised and all obituaries in both books are now indexed in a single file, indexed by name of Deceased as well as by name of Father & Mother. Thu., June 05, 2008 - David Preston Taylor added to "Window to the Past" of the "Publications" section. Wed., June 04, 2008 - WWII Glider Hopkins Farm added to "Old News" of the "Publications" section. Sun., May 18, 2008 - Giffin Family added to "Window to the Past" of the "Publications" section. Sun., May 18, 2008 - John U. Stone added to "Window to the Past" of the "Publications" section. Sun., May 18, 2008 - Felix Burris added to "People" of the "Yesterdays" section. Mon., Mar. 31, 2008 - Postal History added to "Post Office" of the "Cultural Resources" section. Mon., Mar. 31, 2008 - Something About the News added to "More Old News" of the "Yesterdays" section. Tue., Mar. 25, 2008 - Nora Whittle Keeth added to "Window to the Past" of the "Publications" section. Sat., Mar. 22, 2008 - Kliethermes Bridge Destroyed added to the "Cultural Resources" section. Mon., Mar. 03, 2008 - Miller County Guardianship Index in HTML format added to the "Library" section. Fri., Feb. 01, 2008 - Maries County Marriages in HTML format added to the "Library" section. Sat., Nov. 17, 2007 - Thomas D. Garner Sr. added to "Window to the Past" of the "Publications" section. Sat., Nov. 17, 2007 - Frank & Jesse James added to "Window to the Past" of the "Publications" section. Sat., Nov. 10, 2007 - Adjustable Font Sizes added adjustable font sizes to most pages on the website. See the "A+ and A-" images near the upper right hand side of most web pages. Not all pages are implimented as of yet; however most of the major portion of the content will have adjustable applied and more will be implimented in the future. Wed., Oct. 24, 2007 - William P. Stone added to the "Yesterdays" section under "People". Wed., Oct. 24, 2007 - Robert Price Stone added to the "Yesterdays" section under "People". Wed., Oct. 24, 2007 - Samuel H. Sone added to the "Yesterdays" section under "People". Wed., Oct. 24, 2007 - Lee Franklin Bean added to "Window to the Past" of the "Publications" section. Wed., Oct. 24, 2007 - John Hunter Ferguson added to the "Yesterdays" section under "People". Tue., Oct. 23, 2007 - Pardon of Thomas Heath added to the "Yesterdays" section under "Events". Tue., Oct. 23, 2007 - Jeremiah J. Helsel added to "Window to the Past" of the "Publications" section. Tue., Oct. 23, 2007 - Ferryboat Accident added to the "Yesterdays" section under "Events". Tue., Sep. 15, 2007 - Isabell Setser added to Window to the Past of the Publications section. Tue., Aug. 28, 2007 - Henry David Wall Concrete House added to Homesteads of the Cultural Resources section. Sun., Aug. 26, 2007 - Graham Family added to Homesteads of the Cultural Resources section. Sun., Aug. 26, 2007 - Wilde-Burkel Hotel added to Commerce & Industry of the Yesterdays section. Sun., Aug. 26, 2007 - Autogram 1890 added to the Old News of the Publications section. Fri., Aug. 24, 2007 - Homesteads a new section in Cultural Resources on Miller County's homestead buildings. Thu., Aug. 23, 2007 - Peggy's Picture Book added to Homesteads of the Cultural Resources section. Wed., Aug. 22, 2007 - Skinner School added to the Schools of Cultural Resources section. Tue., Aug. 21, 2007 - Letters Home letter to School Teacher from undisclosed source. Wed., Aug. 15, 2007 - Gattermeir Milling at Olean a section in Yesterdays on Miller County's Businesses and Commerce. Sun., Aug. 12, 2007 - Photo upload page available from Miller County Schools Project page. Sun., Aug. 05, 2007 - Miller County Schools Project Please help. Sat., July 27, 2007 - Guestbook discontinued. Excessive spamming occurring. Sun., July 22, 2007 - Library Added 52 new pages to "Miller County Marriages (HTML)" section. Maries County Marriages (52 more pages) will be done by the end of the week. Sun., July 15, 2007 - Organizations Added three new pages to "Organizations" section. Sun., July 15, 2007 - Old News Added one new page to "Old News" section. Sat., July 14, 2007 - Old News Added two new pages to "Old News" section. Fri., July 13, 2007 - Organizations Added four new pages to Organizations section. Fri., July 13, 2007 - Discussion Board Added a "Discussions Board" similar to that on RootsWeb.com. Please feel free to try it out. Your comments are solicited and appreciated. Fri., July 13, 2007 - Commerce & Industry Added seven new pages to Commerce & Industry section. Moving on to Organizations. Thurs., July 12, 2007 - Commerce & Industry Added three new pages to Commerce & Industry section. More to come. Sun., June 24, 2007 - Listing of Microfilmed County Records under "Library" > "Reference Materials (101 KB)"
Sun., June 23, 2007 - Charles Smith - Revolutionary War Soldier in the "Old News" Section under "Publications" on the menu. Sun., June 23, 2007 - On the Trail - Peggy Hake in the "History" Section under "Cultural Resources" on the menu. Sun., June 23, 2007 - Minnie Bell Bilyeu Edwards – Personal Memoirs in the "Letters Home" Section under "Publications" on the menu. Sun., June 17, 2007 - Completed pages A thru I in the biographical sketches in the "People" Section under "Yesterdays" on the menu. Sat., June 16, 2007 - Updated President's Page See you at the ice cream social today. Fri., June 15, 2007 - Major renovation of all "Letters Home" under "Publications". Sun., June 10, 2007 - John Edgemond to Jont. Roberts (1928) to "Publications" under "Letters Home". Sun., June 10, 2007 - Added Dr. John Harry Moore to "Window to the Past". Fri., June 08, 2007 - Added Garner's Mill for "Events" under "Yesterdays". Fri., June 08, 2007 - Added seven new pages for "Landmarks" under "Cultural Resources". Sat., June 02, 2007 - Added new e-mail addresses for 'Probate; and 'Acessions'. Sat., June 02, 2007 - John Gill Edwards WWI Letter "Publications" under 'Letters Home'. Sat., June 02, 2007 - Miscellaneous Bios & Photos "Publications" under 'Window to the Past'. Sat., June 02, 2007 - George Washington Edwards Civil War Letter "Publications" under 'Letters Home'. Sat., June 02, 2007 - Roy Sullivan WWI Letter "Publications" under 'Letters Home'. Sat., June 02, 2007 - Added Rex Wyrick WWII Letter "Publications" under 'Letters Home'. Sat., June 02, 2007 - Added Burris Hotel Article for "Cultural Resources" under 'Landmarks'. Fri., June 01, 2007 - Added six pages for 'Events' under 'Yesterdays'. Fri., May 25, 2007 - Set up pages for 'People' under 'Yesterdays'. Biographical thumbnails of Miller County People. Fri., May 18, 2007 - Increased total available online storage from 50MB to 100MB and increased available e-mail boxes from five to twenty. Tues., May 08, 2007 - Added 'Contact' Page and new e-mail address. Mon., May 07, 2007 - Added Photos of various people to "Window To The Past" Biographies. Sun., May 06, 2007 - Added N, O, P, Q, R, S, T, U, V, W, X, Y, & Z Surnames to "Window To The Past" Biographies. Sat., May 05, 2007 - Added C, D, E, F, G, H, I, J, K, L & M Surnames to "Window To The Past" Biographies. Fri., May 04, 2007 - Added A & B Surnames to "Window To The Past" Biographies. Sun., Apr. 29, 2007 - Added Site Search function to website. Sat., May 05, 2007 - Calendar Change - On Saturday , May 5th, The Miller County Historical Society"s Open House at the museum will serve Iced Tea, Lemonade and Cookies on the porch after tours of the museum from 1 to 3 pm. The Bean Supper was cancelled due to construction. The museum is located on Hwy 52 in Tuscumbia. MCHS President, Joe Pryor and Members of the Board will be happy to discuss plans for the new addition. Everyone is welcome.